Tutorials and other articles to get you started in Cybalounge. These have all you need to start putting together a web-world to tell visitors about your favorite topic. That will work best if you set up welcome times when you are personally there to tell them yourself. CybaLOUNGE is a user-built 3D virtual world running in your browser. Virtual worlders already know how to build in a virtual world. More important: They know what to build and what to do. These tutorials are particularly suited for virtual worlders. This page will be updated as more tutorials are added. Complete sets for a web show. Managing welcome times, email notification. Chrome search on page: CTRL f opens a search bar upper middle..
A tour of web-based virtual world CYBALOUNGE with the ACRL Virtual World Interest Group on Sept 17, 2017. Creator of CYBALOUNGE explains it as a "gateway to virtual worlds" for those who do not want the steep learning curve of downloading software platforms. about how web-worlds can act as gateways to the virtual worlds. Nothing to download: access in your browser. No registration: enter as guest. Guests can walk around (arrow keys), talk* to people, visit places. *Chrome works for talking most of the time. Other browsers may work. We can import content from OpenSim. We have elaborate toys in virtual worlds, but they don't clutter the closet. Here are videos about three. This is the kind of content we might use in our upcoming Web Report. The learning plan offers tasks demonstrating achievements of a learning objective. Success on a task bursts 1 to 5 balloons depending on task difficulty. A learner has a column on the scoreboard. Each pop creates a balloon in the column. The balloons pile up. Filling the column to the top is a win. In competitive play, all learners have a place on the scoreboard. They compete to win early. But everyone who learns is a winner. Doc Grun does comedy at Lauren's place. Videos. Live Capture of a live show. This is the kind of content we will put in the Web Report, Entertainment Section. Coming Soon: a place on your browser for you to film your comedy bit. Secrets of mesh, uploading, and physics in OpenSim. Videos and screen shots by Tampa Powers showing how to upload mesh correctly, explaining Level of Detail (LOD), and showing why attention to LOD and the collision surface matters. Since the changes were made in .9 some people seem to have some trouble understanding on how to upload mesh properly. Maybe I can help by showing how I do it now, which seems to work fine for the most part. Fred Beckhusen (aka Ferd Frederix): Perfect! Best how to upload mesh video I have seen since forever. 2017 PEOPLE: IMA: Godzilla and the boats: Testing the sim and the physics. Research can be fun. Godzilla and the boats: Testing sim and physics. Research can be fun. An outing tests physics and gives us a ride around Godzilla. Content candidate for 3D Web Show, Easy Living Section. The IMA Test Session tried water vehicles on IMA Alpha around our new Godzilla. AvatarFest 2017 Sharing our light. Yes, this report is frankly promotion about virtual worlds and active communities in virtual worlds. It will report on virtual world community activities in areas such as education, art, entertainment, theater/writing, travel, model-building,and disabilities. The target audience includes people in the "real world" communities interested in these topics, especially those who can be reached in G+ communities, Facebook groups, and other social media outlets. 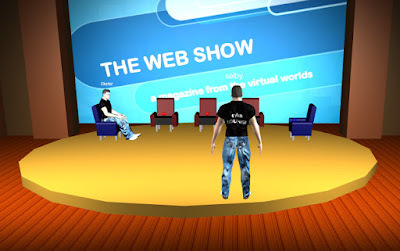 I am planning a video web show, working title: "The Web Report,"
Travel in the Virtual Worlds. Contact Selby Evans in Kitely or Thinkerer Melville in Second Life. Virtual reality and virtual worlds have something for everyone! Would you like to live in a mansion? Dance with friends across the globe? Race jet skis, tanks or airplanes? Create amazing builds with animation and complicated scripts? Share your creativity? The opportunities are literally and virtually endless. Using a realistic avatar (or some other creation you choose), you can EASILY join the fun. After much input from the virtual world community, IMA's vision is clear. Thank you to the community for your images and your thoughts :) Take a look! We always welcome new members to help us reach our common goal to advance virtual technologies for all of us. It's free! You can find community information at https://infinitemetaverse.org or more detailed R&D information at http://infinitemetaverse.com but we encourage you to sign up for both sides of the house. We hope to see you soon! Meaning: here is a talk show set you can come to on a Chrome browser. You come as an avatar, talk to a few others or just talk by yourself. You can live stream the talk to whatever size audience you have. And for now, all this is free. Go to Cybalounge. You don't need to register. Enter as guest. Click the pushpin (bottom line) and scroll down to the Web Show world. Wait a bit for the set to load and voice to connect. Click the Mic (bottom line) to turn on voice. You can talk with your guests, record video, put it on YouTube or elsewhere. Or you can stream live. Free for now.